FULTON, NY – Concetta Marie Dickquist, 99, formerly of Fulton, died peacefully at Hospice of the Comforter in Orlando, Fla., on Wednesday September 26, 2018. Mrs. Dickquist was born in Fulton, to the late Vincent and Equida (Vecchio) DiBernardo. She had moved to Florida to be closer to her family. Concetta will forever be remembered for her style, grace, humor, hard work and being a wonderful cook. She was a compassionate and loving caregiver to her family. Concetta’s happiest times were with her family. She had been employed by General Electric, Syracuse, as a team leader. Concetta was a past communicant of Holy Family Church and a current member of Holy Trinity Church, Fulton. She loved to walk, talk and travel and bowl with her best friend, Anne Lalik. Together they were on various bowling leagues for more than 60 years and October 7, 2000, Anne and Kay (as Concetta was known to many) were inducted into the Fulton Women’s Bowling Association Hall of Fame. Concetta enjoyed traveling to North Carolina and Florida to stay with her children during the winter months. She always loved to cook and have her family together. She also enjoyed playing high stakes Bingo at the casino and local churches. Concetta was predeceased by her husband, Michael J. Dickquist, in 2001; and siblings: Carmella Bifera, Rose Pannofino, Joseph DiBernardo and Jack DiBernardo. 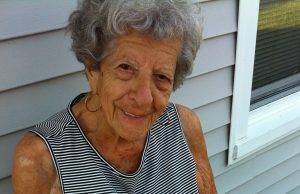 Concetta was a loving mother, grandmother and great-grandmother. She will be greatly missed by her surviving sons: Michael Dickquist of Fulton, Dennis Dickquist of Orlando, Fla., and David (Amy) Dickquist of Salisbury, NC; grandchildren: Tamara Townsley, Victoria Dickquist and Michael V. Dickquist; great-grandchildren: Kaydn, Chloe, Lucy, Jonathan, Kaylyne, Tia, Tommy, Nicholas, Madison, Ethan and Isabella; close family friends and caregivers to Concetta: Kathy LaDuke and Alan Root; and several nieces and nephews. Calling hours will be held 8 to 9:45 a.m. Tuesday in the Sugar Funeral Home, Inc., 224 W. Second St. S., Fulton. A Mass of Christian Burial will be held at 10:30 a.m. Tuesday at Holy Trinity Church, Fulton, celebrated by Rev. Joseph Scardella. I have fond memories of playing bingo with Kay, Anne Lalik and all oftheir friends. My condolences to Kay’s family on their loss. Oh my goodness!! I was thinking of Mrs. Dickquist recently. She was a wonderful lady; stylish, good hearted and honest. We were definitely blessed to have her in our community! My prayers and sympathy to her sons. May she rest in peace. To Dave & Amy, Dennis & Alan, Michael & Cathy, all her grandchildren, and great grandchildren: we are sorry for the pain you are feeling at the loss of your awesome Mom. We know how much you all loved her. She was a very special person with such a big heart and I bet there is a great reunion in heaven this day? ?